Laser stands for Light Amplification by Stimulated Emission of Radiation. 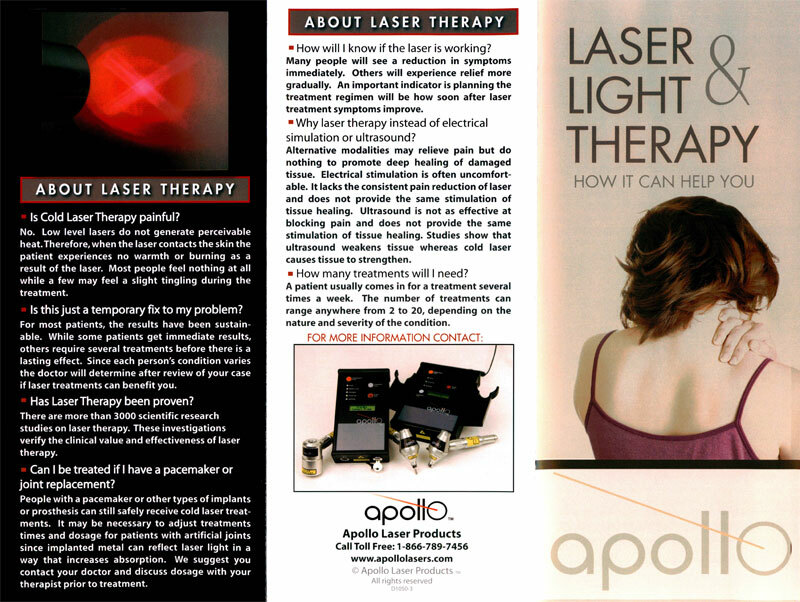 Laser therapies are medical treatments that use focused light. Unlike most light sources, light from a laser is tuned to specific wavelengths. This allows it to be focused into powerful beams that penetrate the skin and directly affect the body’s deeper tissues. When cells absorb this light energy, it initiates a series of events in the cell that creates a protein called ATP. Your cells use this ATP as a fuel source for anything it needs, especially for healing. Eventually this will result in normalizing damaged or injured tissue, a reduction in pain, inflammation, edema and an overall reduction in healing time by increasing intracellular metabolism. 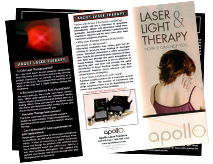 Getting laser therapy is quick and easy. 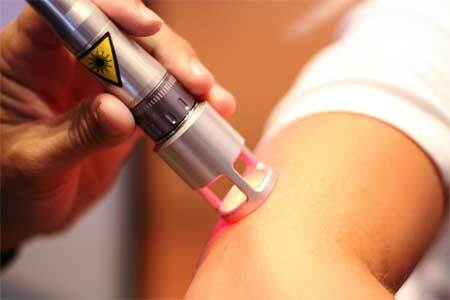 Most people only feel a slight comforting warmness when the laser is being applied. 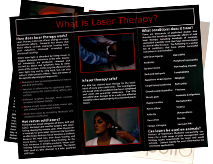 We use laser to treat a wide array of conditions, ranging from Bell’s Palsy, Migraines Tension headaches, Trigeminal Neuralgia, Sinusitis, Temporomandibular Joint Syndrome (TMJ), Cervical Disc Herniation, Cervical Stenosis, Cervical, Thoracic, Lumbar Sprain/Strain, Coccydynia, Costochondritis, Spinal Hypermobility Syndrome, Herpes Zoster/ Shingles, Post-Surgical Pain, Slow Healing Wounds, Acromioclivicular (AC) Sprain, Biceps Tendinitis, Biceps Tendon Strain, Triceps Strain, Carpal Tunnel Syndrome, DeQuervain’s Tendinitis, Frozen Shoulder, Ganglion Cyst, Olecranon Bursitis, Radial or Ulnar Neuritis, Rotator Cuff Strain, Subacromial Bursitis, Tennis Elbow, Golfer’s Elbow, Osgood Schlatter Syndrome, Osteochondritis Dissecans, Patellar Tendinitis, Patellofemoral Syndrome, Peripheral Neuropathy, Piriformis Syndrome, Plantar Fasciitis, Baker’s Cyst, Restless Leg Syndrome, Sesamoiditis, Shin Splints, Sprained Ankle, Tarsal Tunnel Syndrome, Tensor Fascia Lata and Iliotibial Band Syndrome, Trochanteric Bursitis, to others and more! 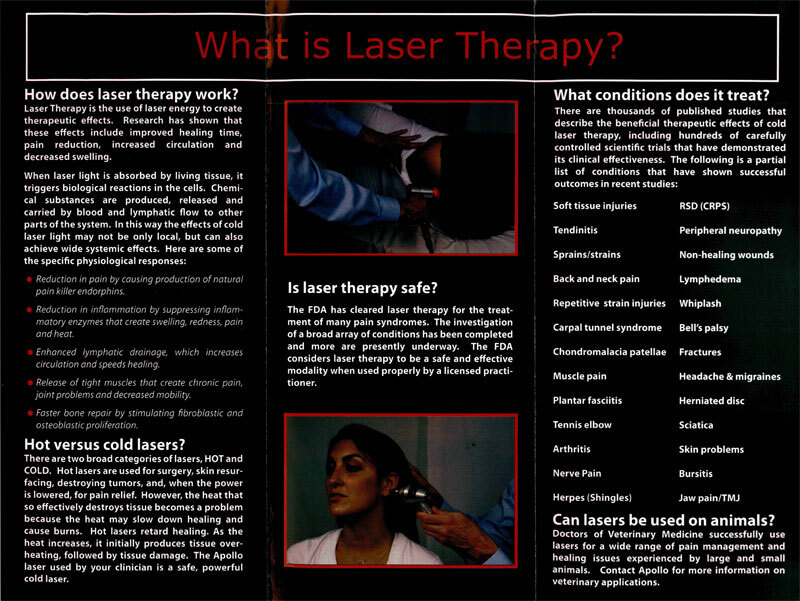 Laser therapy can be used as a stand-alone treatment, or with rehabilitative exercise therapy. Rehabilitative exercises and laser therapy complement each other nicely.